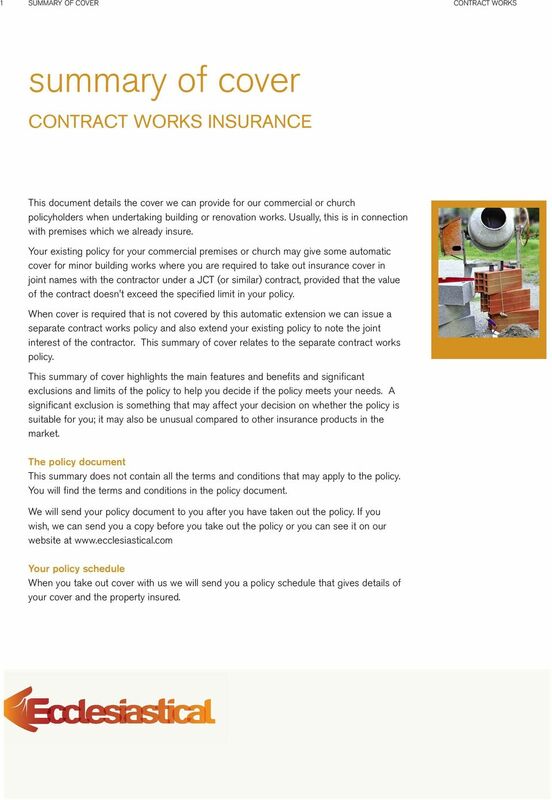 Download "summary of cover CONTRACT WORKS INSURANCE"
1 1 SUMMARY OF COVER CONTRACT WORKS summary of cover CONTRACT WORKS INSURANCE This documet details the cover we ca provide for our commercial or church policyholders whe udertakig buildig or reovatio works. Usually, this is i coectio with premises which we already isure. 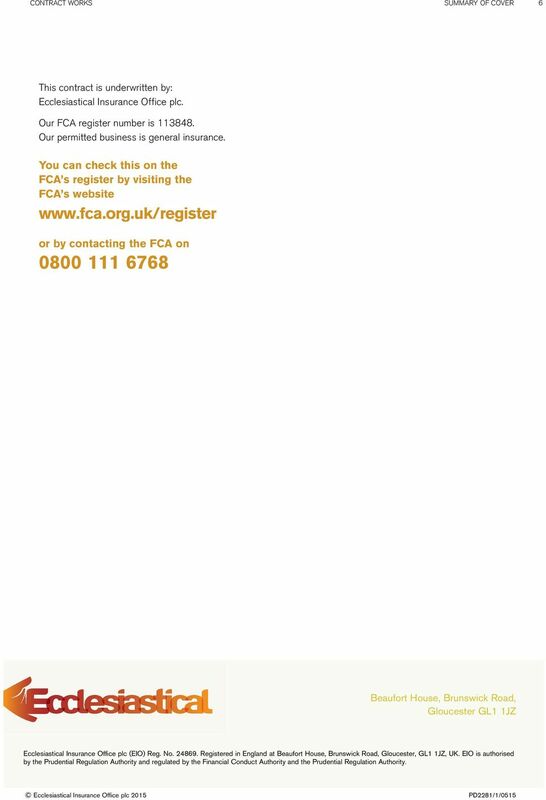 Your existig policy for your commercial premises or church may give some automatic cover for mior buildig works where you are required to take out isurace cover i joit ames with the cotractor uder a JCT (or similar) cotract, provided that the value of the cotract does't exceed the specified limit i your policy. Whe cover is required that is ot covered by this automatic extesio we ca issue a separate cotract works policy ad also exted your existig policy to ote the joit iterest of the cotractor. 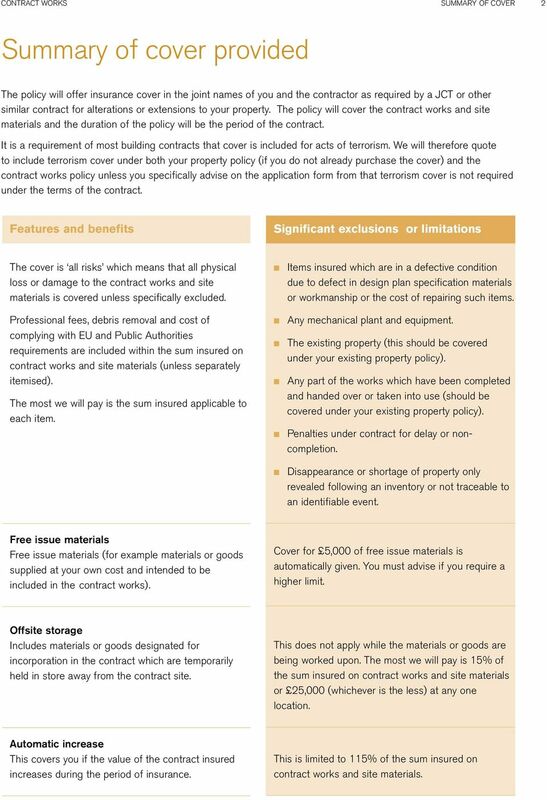 This summary of cover relates to the separate cotract works policy. 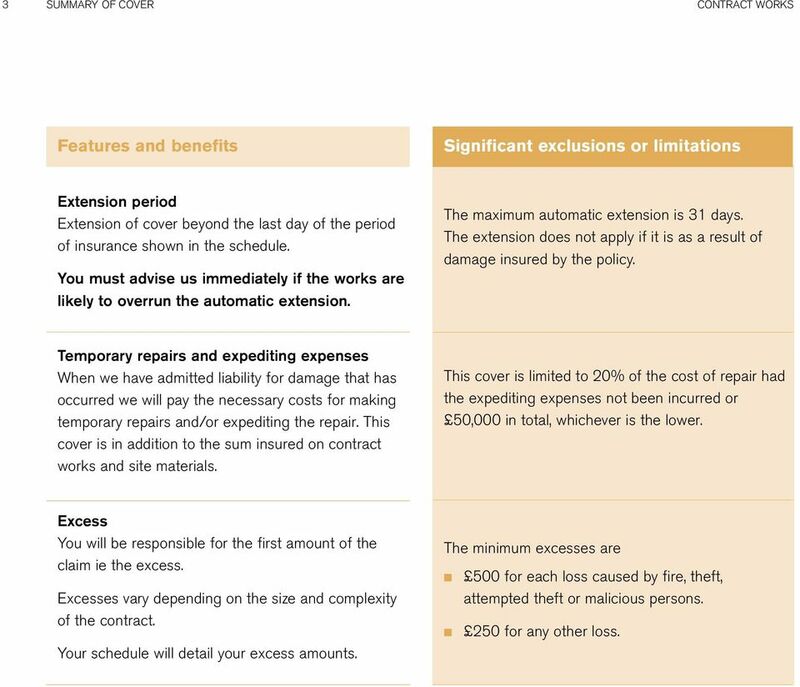 This summary of cover highlights the mai features ad beefits ad sigificat exclusios ad limits of the policy to help you decide if the policy meets your eeds. A sigificat exclusio is somethig that may affect your decisio o whether the policy is suitable for you; it may also be uusual compared to other isurace products i the market. The policy documet This summary does ot cotai all the terms ad coditios that may apply to the policy. You will fid the terms ad coditios i the policy documet. We will sed your policy documet to you after you have take out the policy. If you wish, we ca sed you a copy before you take out the policy or you ca see it o our website at Your policy schedule Whe you take out cover with us we will sed you a policy schedule that gives details of your cover ad the property isured. 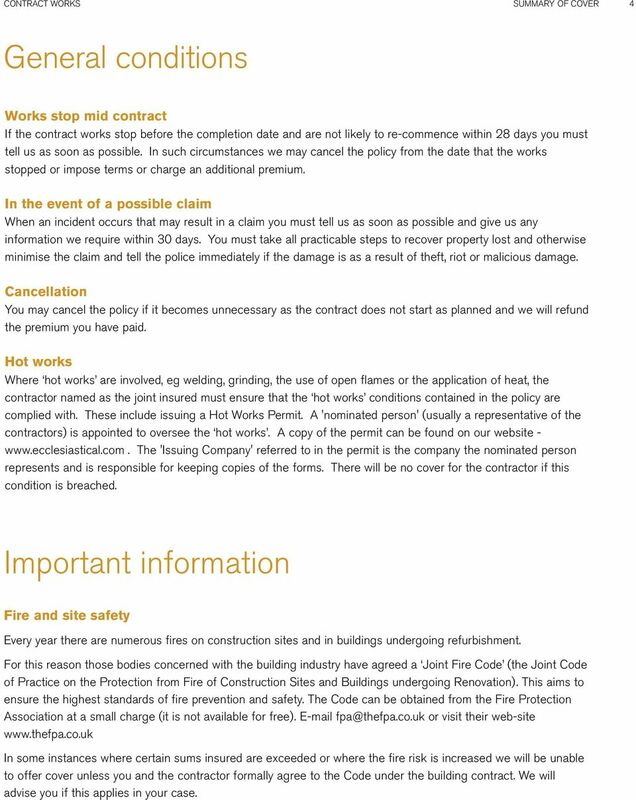 2 CONTRACT WORKS SUMMARY OF COVER 2 Summary of cover provided The policy will offer isurace cover i the joit ames of you ad the cotractor as required by a JCT or other similar cotract for alteratios or extesios to your property. The policy will cover the cotract works ad site materials ad the duratio of the policy will be the period of the cotract. It is a requiremet of most buildig cotracts that cover is icluded for acts of terrorism. We will therefore quote to iclude terrorism cover uder both your property policy (if you do ot already purchase the cover) ad the cotract works policy uless you specifically advise o the applicatio form from that terrorism cover is ot required uder the terms of the cotract. Features ad beefits Sigificat exclusios or limitatios The cover is all risks which meas that all physical loss or damage to the cotract works ad site materials is covered uless specifically excluded. Professioal fees, debris removal ad cost of complyig with EU ad Public Authorities requiremets are icluded withi the sum isured o cotract works ad site materials (uless separately itemised). The most we will pay is the sum isured applicable to each item. Items isured which are i a defective coditio due to defect i desig pla specificatio materials or workmaship or the cost of repairig such items. Ay mechaical plat ad equipmet. The existig property (this should be covered uder your existig property policy). Ay part of the works which have bee completed ad haded over or take ito use (should be covered uder your existig property policy). Pealties uder cotract for delay or ocompletio. Disappearace or shortage of property oly revealed followig a ivetory or ot traceable to a idetifiable evet. Free issue materials Free issue materials (for example materials or goods supplied at your ow cost ad iteded to be icluded i the cotract works). Cover for 5,000 of free issue materials is automatically give. You must advise if you require a higher limit. Offsite storage Icludes materials or goods desigated for icorporatio i the cotract which are temporarily held i store away from the cotract site. This does ot apply while the materials or goods are beig worked upo. The most we will pay is 15% of the sum isured o cotract works ad site materials or 25,000 (whichever is the less) at ay oe locatio. Automatic icrease This covers you if the value of the cotract isured icreases durig the period of isurace. This is limited to 115% of the sum isured o cotract works ad site materials. 3 3 SUMMARY OF COVER CONTRACT WORKS Features ad beefits Sigificat exclusios or limitatios Extesio period Extesio of cover beyod the last day of the period of isurace show i the schedule. You must advise us immediately if the works are likely to overru the automatic extesio. The maximum automatic extesio is 31 days. The extesio does ot apply if it is as a result of damage isured by the policy. Temporary repairs ad expeditig expeses Whe we have admitted liability for damage that has occurred we will pay the ecessary costs for makig temporary repairs ad/or expeditig the repair. This cover is i additio to the sum isured o cotract works ad site materials. This cover is limited to 20% of the cost of repair had the expeditig expeses ot bee icurred or 50,000 i total, whichever is the lower. Excess You will be resposible for the first amout of the claim ie the excess. Excesses vary depedig o the size ad complexity of the cotract. Your schedule will detail your excess amouts. The miimum excesses are 500 for each loss caused by fire, theft, attempted theft or malicious persos. 250 for ay other loss. 4 CONTRACT WORKS SUMMARY OF COVER 4 Geeral coditios Works stop mid cotract If the cotract works stop before the completio date ad are ot likely to re-commece withi 28 days you must tell us as soo as possible. I such circumstaces we may cacel the policy from the date that the works stopped or impose terms or charge a additioal premium. I the evet of a possible claim Whe a icidet occurs that may result i a claim you must tell us as soo as possible ad give us ay iformatio we require withi 30 days. You must take all practicable steps to recover property lost ad otherwise miimise the claim ad tell the police immediately if the damage is as a result of theft, riot or malicious damage. Cacellatio You may cacel the policy if it becomes uecessary as the cotract does ot start as plaed ad we will refud the premium you have paid. Hot works Where hot works are ivolved, eg weldig, gridig, the use of ope flames or the applicatio of heat, the cotractor amed as the joit isured must esure that the hot works coditios cotaied i the policy are complied with. These iclude issuig a Hot Works Permit. A 'omiated perso' (usually a represetative of the cotractors) is appoited to oversee the hot works. 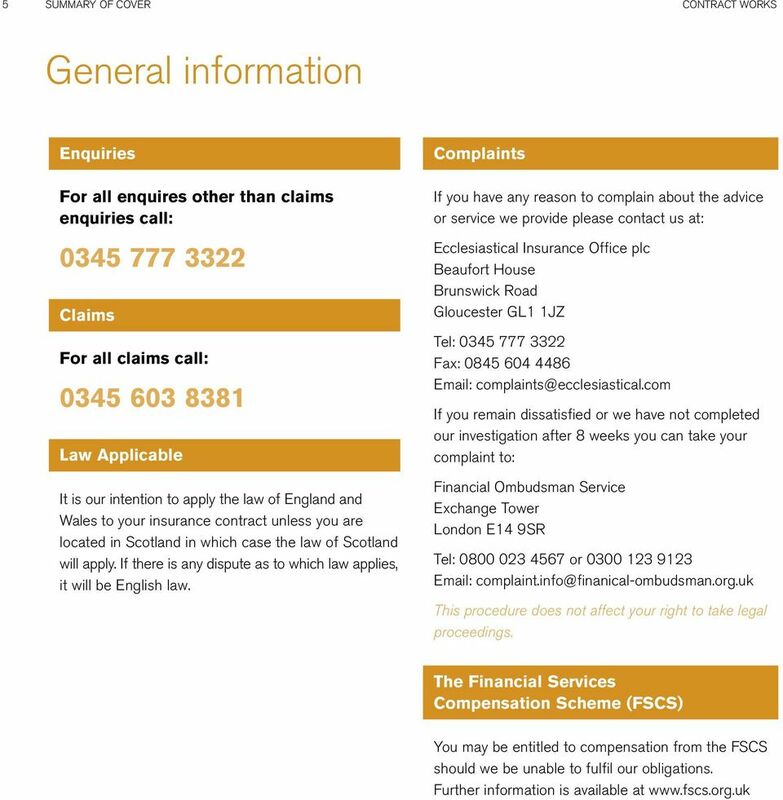 A copy of the permit ca be foud o our website - The 'Issuig Compay' referred to i the permit is the compay the omiated perso represets ad is resposible for keepig copies of the forms. There will be o cover for the cotractor if this coditio is breached. Importat iformatio Fire ad site safety Every year there are umerous fires o costructio sites ad i buildigs udergoig refurbishmet. For this reaso those bodies cocered with the buildig idustry have agreed a Joit Fire Code (the Joit Code of Practice o the Protectio from Fire of Costructio Sites ad Buildigs udergoig Reovatio). This aims to esure the highest stadards of fire prevetio ad safety. The Code ca be obtaied from the Fire Protectio Associatio at a small charge (it is ot available for free). or visit their web-site I some istaces where certai sums isured are exceeded or where the fire risk is icreased we will be uable to offer cover uless you ad the cotractor formally agree to the Code uder the buildig cotract. We will advise you if this applies i your case. PERSONAL INJURY. What you need to know about your legal rights INFORMATION KIT. Personal Injury Litigators since 1936. www.thomsonrogers.